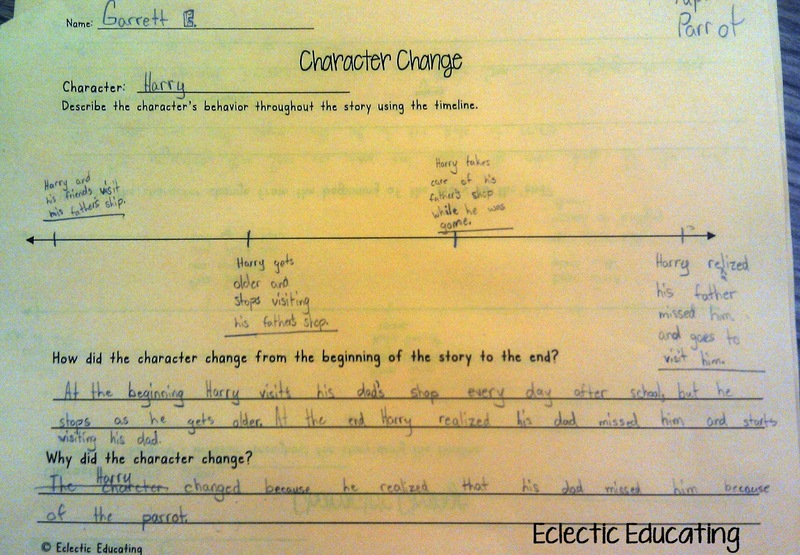 My fifth graders and I have been working on character change for a couple of weeks. 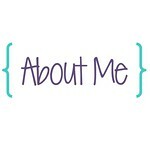 When I was planning this lesson, I thought to myself, what better way to show change over time than with a timeline? As a result, my students and I used timelines to show how our characters changed throughout stories. 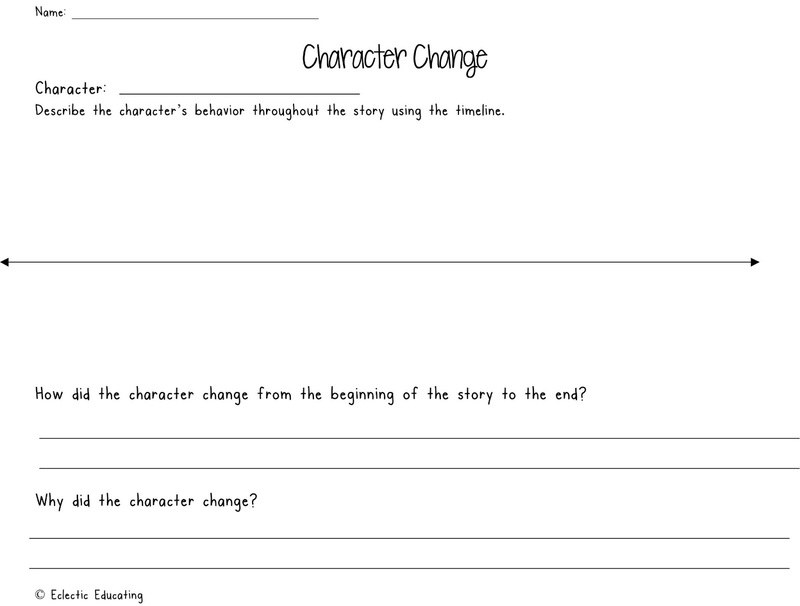 We then used our timeline to complete short answer questions about these character changes. To begin, I read aloud the story The Recess Queen . This story has a very clear, straightforward example of character change. The main character, Mean Jean, starts out as a bully. A new girl moves to school and asks Mean Jean to play at recess. Mean Jean has never been asked to play before, and this is the turning point in the story where she stops being a bully. 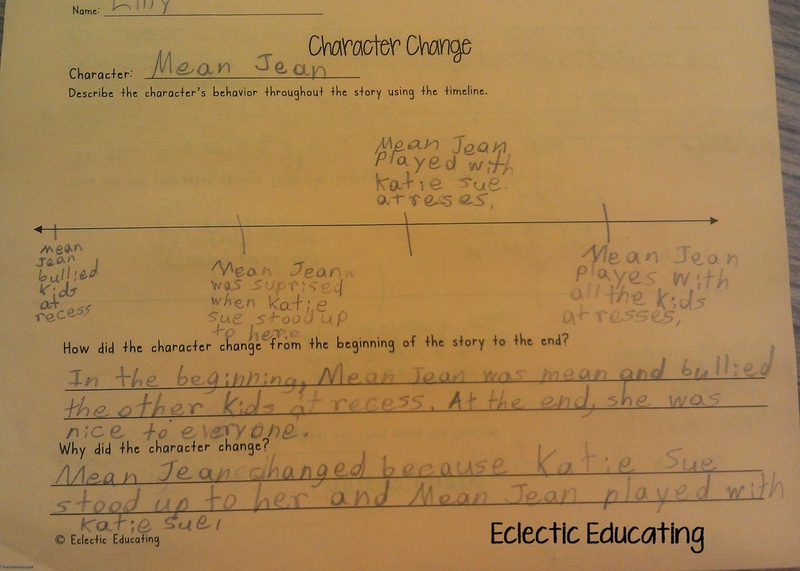 After reading aloud the story, I modeled how to use a timeline to show how the character in the story (Mean Jean) had changed over time. 1. How did the character change from the beginning of the story to the end? 2. Why did the character change? With these questions, we were focusing on the overall change of the character, from the beginning to the end, summed up in 1-2 sentences. We also focused on why the character changed, which is always a very important part of the story and key to understanding the character. After the read-aloud, we moved to guided practice. Students read a short story called Papa's Parrot. This is from Cynthia Rylant's book Every Living Thing . 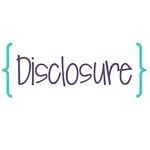 (Which you must read if you haven't already!) In this short story, Henry learns to appreciate his father more once he becomes sick. This is a beautiful story that explores some deep emotions. The students and I completed the timeline and written response questions together with this story. 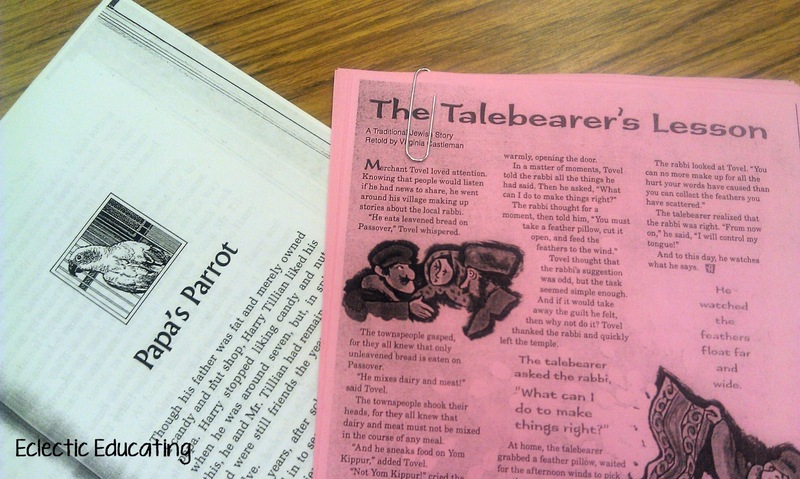 Then, we moved onto a short story from Highlights magazine called The Talebearer's Lesson. I absolutely love this folktale. The main character goes around town spreading lies about the local rabbi, but eventually feels guilty. He goes to the rabbi seeking forgiveness, and the rabbi instructs him to open up a pillow and feed the feathers to the wind. After he has completed this task, he returns to the rabbi for further instructions. The rabbi tells him to go collect the feathers. When the man explains that he cannot possibly collect all of the feathers, the rabbi explains that this is a metaphor for telling stories about people. You can never take back what you have said. It has already spread all over. This was a tricky message for my students, but once they figured it out, they loved it! They felt so smart! With this story, students completed the timeline and questions independently. We are continuing to work on the structure of our written responses, but overall the students did a very nice job. 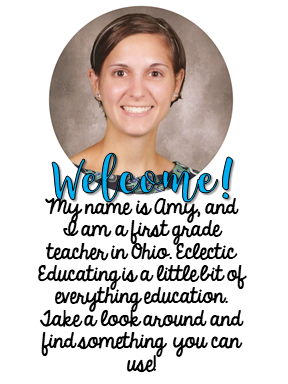 If you would like a copy of the graphic organizer click here or on the image above. Do you have any special ways of teaching character change or book recommendations? Love this lesson! I'm pinning it! ;)Happy Friday! We used a timeline after reading the book "Andy Shane and the Very Bossy Dolores Starbuckle." We had taken post-it note summaries after every few pages, so putting them together on a timeline really helped the students to see the change in character. Great minds think alike! I love The Recess Queen. I use The Paperbag Princess to look at character change too. I have not read "Every Living Thing" but I will since you said I had too! Thanks so much for the freebie - I love it, what a great way to guide students. You're Mean, Lily Jean by Frieda Wishinsky would also work for this cool lesson. LOVE how you used the timeline to track the character's growth!! Thanks for sharing. What a great book and a fantastic way to teach about characters!